TOKYO (WASHINGTON POST) - Trump delivered a much-anticipated speech in Tokyo that the Japanese government hopes will make waves. But it was not President Donald Trump, who is arriving here on Sunday (Nov 5); it was Ivanka. 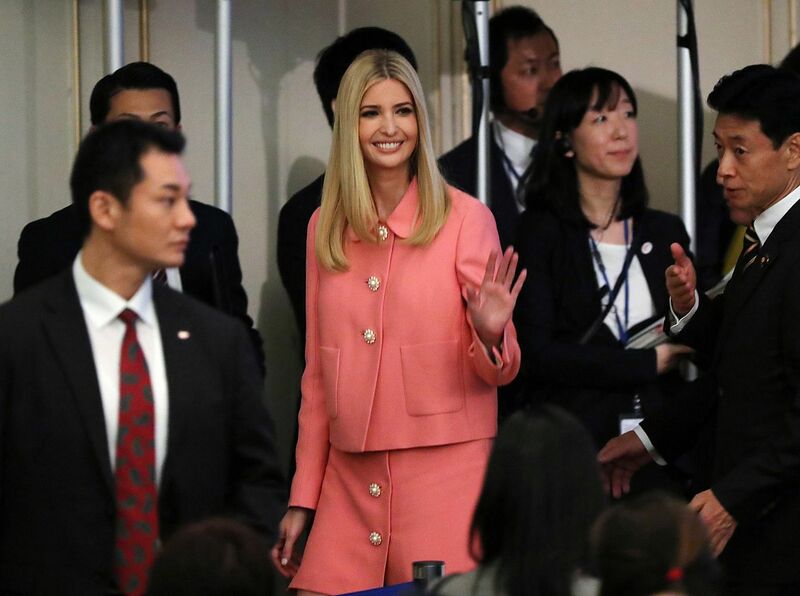 The first daughter and adviser to the president addressed the Japanese government's World Assembly for Women conference on Friday, a double-whammy win for Prime Minister Shinzo Abe. First, he gets a high-profile speaker for one of his key initiatives - and one that has failed to bear any other fruit: increasing women's participation in the Japanese workforce, or, in Japanese government parlance, an initiative letting women "shine". Second, Abe can curry more favour with Donald Trump just two days before he arrives in Tokyo on his first trip to Japan as president. The visit will include golf at a country club and a banquet, but no headline speech. That job will fall instead to his daughter. Ivanka Trump gave a "special speech" on female entrepreneurship and women's participation in the economy, similar to those she made during a women's forum hosted by Angela Merkel in Germany earlier this year. "I deeply respect and honour women who choose to work inside the home full time to care for their families," she said in an 18-minute speech at the forum, with Abe sitting on the stage beside her. "We never want to discourage that incredible calling, but we must also ensure that every woman has the freedom to work outside the home if they so choose." The Japanese government added a day to what's usually a two-day conference, scheduling her speech on a public holiday because she couldn't make it earlier. But Abe, who introduced her to the audience, wanted them to hear from IvankaTrump, described by one of his top aides this week as "one of the most remarkable people in the world because she is actively trying to support women entrepreneurs and improve women's participation in society". Trump praised Abe's efforts to promote women's participation in the workforce in Japan. She said the United States and Japan must do more to make it easier for women to balance career and family, and to create environments where women feel welcome and valued. "All too often our workplace culture fails to treat women with appropriate respect. This takes many forms, including harassment, which can never be tolerated," she said, indirectly referring to the explosion of sexual harassment allegations in the US since reports emerged of Hollywood producer Harvey Weinstein's actions. She will have dinner with Abe and his wife on Friday night, leaving Japan before her father arrives. Japan has something of a fascination with Ivanka Trump, who is viewed here by some as the perfect woman: She has a career and a beautiful family and blond hair and always looks immaculate. "Many people think she's like a princess," said Lully Miura, a political scientist at the University of Tokyo. "She's well educated, beautiful, sophisticated and rich. And it's very surprising to Japanese women that she can also talk about things that are important to society." At least four television channels broadcast a live shot of an empty escalator on Thursday afternoon, awaiting her arrival at the airport, interspersed with her tweets and Instagram photos. TV commentators noted approvingly that she says she spends 20 minutes each morning meditating and only eight minutes putting on her make-up - balancing her luxury celebrity lifestyle with being a mother of three children. At least one channel had a cardboard cutout of Ivanka on set. The Tokyo metropolitan police have reportedly formed a women-only riot police unit to protect Trump during her visit, although they will be dressed in suits to blend in. Likewise, Japanese companies that import her clothing label say they have had a surge in sales. "Inquiries and orders for the brand increased dramatically from January, and during the busiest period, more than 10 customers contacted us each day because they heard about Ivanka," said Tamana Kawanishi, manager of Chez Ibiza, a clothing shop in Tokyo. "We received zero inquires before the election." An online store, Waja, was selling about six Ivanka Trump brand items of clothing a month before her father was elected president. This year, it has averaged about 600 a month. "I think people who saw the news about Ivanka's visit to Japan are checking our website and buying," said Yukie Suzuki, a Waja spokesman. 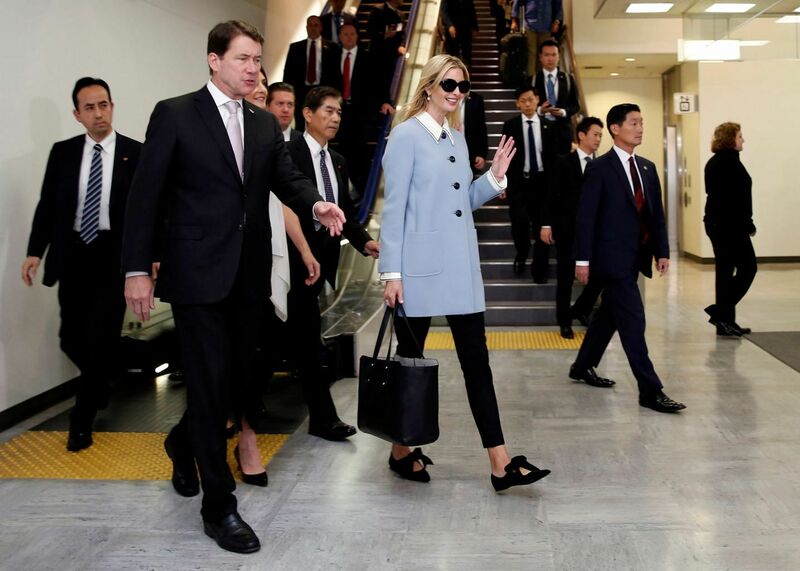 While the 36-year-old's arrival in Japan has generated the kind of coverage usually reserved for celebrities, Ivanka Trump and her message at the prime minister's conference do little to advance the cause of the average Japanese woman, analysts say. "I've long been cynical about his efforts to promote women," said Chelsea Szendi Schieder, an expert on gender in Japan who teaches at Meiji University in Tokyo. Abe's initiative, dubbed "womenomics", seems like a branding effort that promotes a few elite women rather than a serious effort to reduce the wage gap or poverty experienced by single mothers, she said. Abe has championed increasing women's participation in the workforce as a way to pull Japan out of its decades of economic malaise. But his efforts have resulted in little tangible progress. Underlining this, Japan has slipped further in the World Economic Forum's global gender-equality rankings. Japan now comes in 114th out of 144 countries regarding gender equality, making it by far the worst in the Group of Seven industrial nations. Japan stood at 101st in 2012, the year Abe returned to office. The decline in women's "political empowerment", largely because of a reduction in the number of women in parliament and in senior political positions, drove this year's deterioration, according to the report published on Thursday. Only two of the 24 ministers in Abe's Cabinet and less than 10 per cent of members of parliament are women. While more women are working, they are over-represented in part-time or casual jobs that do not come with the security or benefits of regular jobs. Seventy per cent of part-time workers are women, according to the latest statistics from the Japan Institute for Labour Policy and Training. Furthermore, there is strong pressure on women to quit their jobs once they have babies, a phenomenon so prevalent that it has its own name: "mata-hara". short for "maternity harassment". Almost half of working women quit their jobs after having a baby, according to the National Institute of Population and Social Security Research. Much of the problem stems from an inflexible work culture that demands long hours at the office and mandatory attendance at after-work social events. The two highest-profile cases of "death by overwork" in Japan have both involved young women, one an advertising agency worker who killed herself and the other a TV reporter who had a heart attack at 31. But it is also because of a tax structure that provides no incentive for people in a marriage to work and a lack of child-care facilities. But Miura, of the University of Tokyo, commended the right-leaning Abe's efforts to at least try to change the entrenched gender imbalances in Japanese society. "A conservative country like Japan won't change without conservative leadership," she said. "The Abe administration is going in the right direction, but they need to help the ordinary Japanese woman, rather than just promoting these successful elites."